Located in the heart of the Olympic Village, the Four Points by Sheraton Munich Olympiapark offers a fantastic view of Olympic Park. We are located in quiet surroundings, convenient to the BMW headquarters and the underground railway station, which can take you to the heart of Munich in a matter of minutes.105 comfortable guest rooms are available in three different categories. 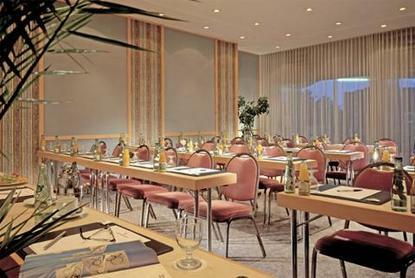 Our Bayern Stub'n restaurant serves Bavarian specialties and international dishes. Three conference rooms are also available for events and private functions.We also offer special packages for FC Bayern home games, concerts, and many other Olympic Park events.Arriving by car? Good news We offer free parking in our hotel garage during your stay.Discover the Four Points by Sheraton Munich OlympiaparkSpecial Condition:From July 19 through August 22, 2008, the Four Points by Sheraton Munich Olympiapark will be renovating some of the guest rooms. Renovation work will occur weekdays from 8am to 6pm and there will be minimal disturbance. After completion, all guest rooms in the hotel will be completely renovated. Please contact the hotel for further information. From December 21, 2008 through January 4, 2009, this hotel will be closedPlease contact the hotel for further information.